It’s that time of year, when the company behind everybody’s favorite golfing arcade game begins to preview the next iteration of of the title for all to see. The company in focus is Incredible Technologies and the game is Golden Tee 2019. 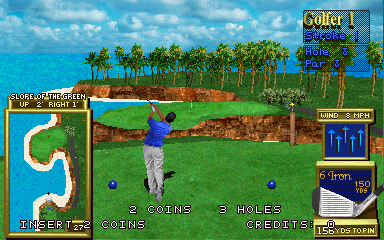 This edition is celebrating a milestone next year, as it marks 30 years of existence for the franchise (this surprised me as I always had read that the original Golden Tee Golf launched in 1990; I checked the original flyer and it says 1989 though). Golden Tee is more popular than ever, at last check there are well over 10,000 units installed in bars, arcades and other out-of-home venues out there. Back when I sold arcade machines for a living, I was always surprised by how many home users would buy that edition to put into their mancave; it was just as popular as any official Pac-Man machine. In celebrating this important occasion, IT has announced that they are introducing a new “casual mode” called Real Time Rivals to the game. This will involve real PGA players such as John Daly and presumably others. The company has also been occasionally showcasing the custom putters and patriotic clothing that will be a part of this update.